I had the pleasure of visiting DC for the Inauguration last month and had an incredibly tasty meal at Farmers Fishers Bakers. They had a great cocktail menu and even give the option of letting the bartender concoct a drink for you. I had the Bourbon Julep and it was refreshing and strong. The Mixologist Jon Arroyo is an LA Native. 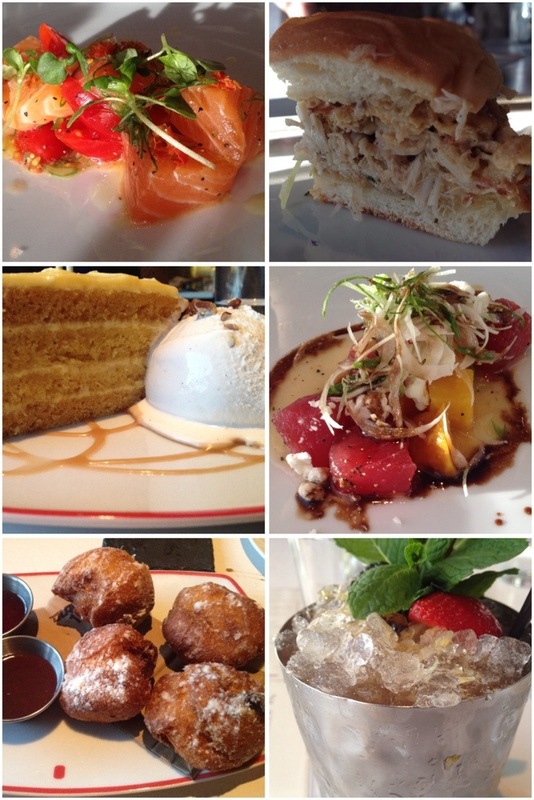 On the top right was a crab cake sandwich that was amazingly fresh and delicious. All of their sushi dishes had their own little spin to them. We had Citrus Salmon (Blood Oranges, Pomegranate Creme Fraiche, Orange Oil, Ponzu Sauce); Red Curry Scallops (Fennel fronds, Cucumber, Asparagus), Salmon Crudo (Tomatoes, Basil, Sundried Tomato, Ponzu Sauce); Big Eye Tuna (French Feta, Gold Beets, Endive, Balsamic Glaze, Ponzu Sauce). For dessert we had Uncle Bucks Beignets with Bourbon Caramel Sauce. That sauce is one of the best things I’ve ever eaten. We also had the Butternut Cake with Salted Bourbon Caramel Ice Cream. The thought of it just makes me drool all over my keyboard. Previous Previous post: The bazaar by Jose Andres Part tres.